Monday: half a fennel bulb left over from a prawn and fennel risotto, some carrot, and an onion, all roasted off in the oven for about twenty minutes first. Fennel is not stocked by the local greengrocer, so I had to go to Morrisons to get it, but it is so nice … The rest went into a prawn and fennel risotto. 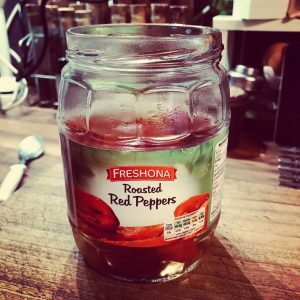 Tuesday: I found an opened (but well sealed) jar of roasted red peppers at the back of the fridge. They smelled absolutely fine, so into the pot they went, with some frozen sweet potato and butternut squash. I absolutely hated this! – didn’t eat it. With hindsight, I should have rinsed the peppers off a lot more to get rid of the brine. But Pete liked it, and consumed the rest on Wednesday, when I was out. Friday: Some time ago, a friend bought me a big box of mushrooms – not sure how much was in there, 2kgs perhaps. We tried manfully to use them all, but we couldn’t, so I sliced up a lot and put them in bags in the freezer. One went into a bolognese sauce a week or two back, but I found another lurking in the bottom drawer, so they went into the soup pot. Bit of tamari. Some cream right at the end. Delicious.